Aloe Vera Gel - 99.75% Certified Organic - 12 oz. Aloe Vera Gel - 99.75% Certified Organic - 12 oz. 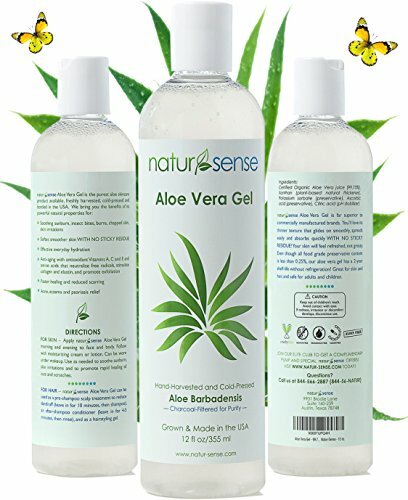 - Premium Quality For Skin, Hair, Sunburn Relief, Naturally Promotes Healing of Acne, Razor Bumps, Psoriasis, Eczema, Dermatitis and Other Irritations.. CONTAINS ALOE CERTIFIED BY THE TEXAS DEPARTMENT OF AGRICULTURE/USDA N.O.P.! Cold-pressed and charcoal filtered, this is the very purest product available on the market today. It's ultra-soothing for insect bites, chapping, and glides on with NO STICKY RESIDUE! FRESHLY HARVESTED BY HAND AND BOTTLED JUST FOR NATUR-SENSE! This product is like having nature in a bottle! It is derived exclusively from Barbadensis Miller, which contains the highest potency of nourishing vitamins, minerals, proteins and enzymes. You can use it every day for refreshing, natural hydration. THE PLANT OF IMMORTALITY! Celebrated for its healing and rejuvenating properties! Modern science confirms its anti-aging benefits due to the antioxidant Vitamins A, C and E, amino acids and enzymes.